Situated in the South East of England, in Eton Wick, close to Eton College and within sight of Windsor Castle, History On Wheels is more than just a motor museum. The Museum was first opened to the public in 1980, and as the name implies, within this Museum can be found a truly unique collection of MOTORS, both Military and Civilian, MILITARIA, from 1900 to the 1950’s, from all conflicting Nations, and MEMORIES, illustrating artefacts of all types from both the civilian and wartime home fronts. Originally constructed as an indoor riding school, the principal building was converted in the late 1970’s to house the Tony Oliver private collection of Vehicles and Militaria. It was generally accepted that the educational and historic significance of this unique collection should be made available to the general public, albeit on certain Open Days throughout the year. The first, very random open days commenced in the 1970’s, and the public response, interest and ever growing attendances came as a very pleasant surprise. The History on Wheels Museum is a privately funded, non profit making, family museum. Tony Oliver is third generation ‘collector’, and has had a life long interest in twentieth century history, specialising in the first and second World War’s. This interest is combined with a desire to research and understand what life was like throughout this tumoltive period, both in war zones, and on the home front. Having partially retired from the family business, Tony now has more time to devote to the Museum. This has already resulted in the building of a 30 + seat CINEMA, in which visitors can see various vehicles from the Museum in use, in both modern and period film. The aim is to bring the vehicle section of the Museum ‘to life’, as opposed to risking the appearance of an, albeit very interesting, static ‘car park’ ! A further improvement has been the extending of the NAAFI Café, to include a DINING AREA, having table seating and 25ft breakfast bar which features panoramic window views of Windsor Castle. In the Summer months the dining area gives access to a large PATIO, where visitors can relax under sunshades and enjoy the fine uninterrupted views of Windsor Castle, while enjoying their tea and snacks. At the opposite end of the NAAFI dining area can be found the MUSEUM COLLECTORS SHOP. 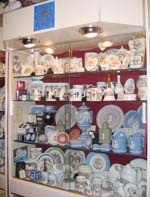 This is believed to be a unique Museum attraction in the U.K., as opposed to selling modern / new ‘Museum Souvenirs’, it offers for sale original collectables, of historic interest, from the period 1900-1945. Vera Oliver’s PRINCESS DIANA COLLECTION, is now recognized as being one of the most extensive currently on display in the U.K., reputedly second only to the collection at Princess Diana’s former home Althorpe, Bedfordshire. The History on Wheels Museum collection comprises thousands of individual Princess Diana related items, of porcelain, glass, silver etc, etc. Ranging from cheap 1981 Royal Wedding souvenirs, to fine quality presentation pieces. With the entire Museum being under cover, ‘wheel chair friendly’, and with Gallery’s 2, 2a, and 3, together with the NAAFI Café, Dining area and Shop all being fully carpeted, the appropriate period background music etc, all combine throughout the year, to ensure that visitors of all age’s are constantly being offered the opportunity step back in time, to view and enjoy the vast selection of rare and fascinating exhibits on display, whatever the weather. Tony and Vera Oliver hope you will enjoy your visit. Vera can always be found running the NAAFI Café, and Tony is invariably on hand to answer any questions, and help in any way. Both are always only to glad to ‘have a chat’, and are always more that willing to listen to any comments, suggestions or recollections that visitors might wish to pass on.